Frank Yellin, a CloudAhoy user, sent yesterday an email with a problem report. 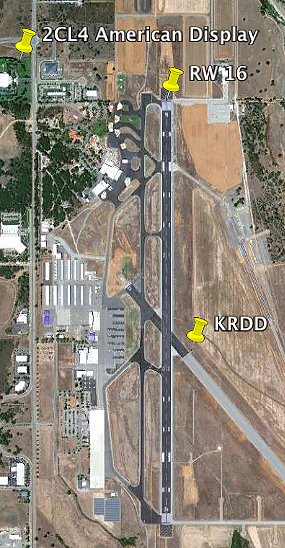 He landed on KRDD runway 16, and CloudAhoy identified it correctly. On his next flight he departed from the very same runway, but that time CloudAhoy identified the airport he departed from as 2CL4, nicknamed American Display, and could not figure out a runway. What gives? In the FAA airport database each airport is represented by one point, typically at around the center of the runways. Turns out that about 2500’ from the approach end of runway 16, outside of the airport, there’s a heliport called American Display. When Frank landed, the touchdown point was closer to KRDD, but when he later took off, the rotation point was closer to 2CL4. CloudAhoy got confused. In other words, a bug. I added an entry to CloudAhoy’s bug database, and planned to investigate it at a later day. Then an hour later another CloudAhoy user, Luke Hayes, sent an email with a similar problem but in a different airport (BTW, both users permitted their names to appear in this post). I figured that my initial assessment, that it’s a rare case, is probably wrong. And so I fixed the bug. If you had a similar problem in a past flight, debrief it again. This will fix the airport name, and will identify the runway too. I was curious what is American Display. I could not find information about the company, but Googling I found two private heliports in CA, both called American Display and owned by the same individual. See this and this. And back to CloudAhoy – report of what’s cooking in the R&D dept: A much improved app (working natively on iPads), and a better helicopter and hot-air balloon debrief including 360° point of view rotation.